We have linens! I’m talking about table cloths for EVERY table at the reception. I know, I know, linens are in no way exciting but after my first experience with the linen sample binder I was anxious to get into the linen showroom to nail down this pesky wedding detail. 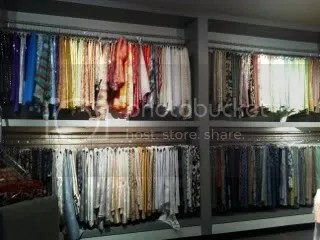 If you have a regular 9-5 Monday through Friday job good luck getting to the linen showroom. It’s only open during silly hours like 10-2 Monday, Wednesday, and Friday. Luckily, I had an extra vacation day to burn and so my mother and I made an appointment for the middle of a Monday. This is what we walked in to. 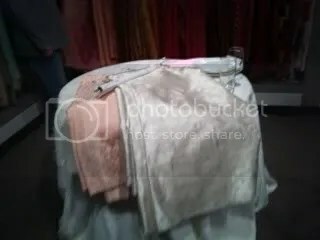 A MILLION table cloths. Luckily our linen consultant knew what she was doing. I brought along some samples of colors that I wanted to incorporate into the reception and she wasted no time pulling five or six linens that fit the bill. I got to see how each of them looked actually on a table. 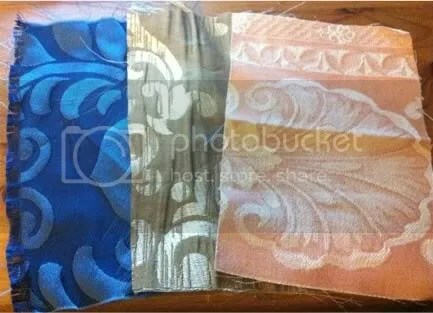 And let me tell you, the linen samples look SO different from the actual linens. Seeing a small piece of fabric does not do the entire pattern of a linen any justice. I remember seeing a few of these swatches in the original linen binder and not liking ANY of them. Seeing them on the table gave me a realistic sense of how my whole table vision (linens, flowers, candles, etc) would come together. Comparing different cloths next to each other allowed me to eliminate linens more easily. After a little bit of back and forth, setting and unsetting the table, taking off and putting back on the same linens in different combinations, and changing my mind a couple of times, I managed to pick my dining table linens. I felt a huge relief upon making the final decision. As I started getting ready to leave I was informed that we weren’t quite done yet. 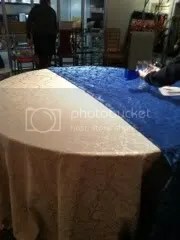 Apparently there are a lot of different kinds of tables at a wedding (these linen people are sneaky) dining tables, cocktail tables, cake tables, favor tables, place card tables, DJ and Bar tables, TOO MANY TABLES. I made some easy choices pulling from my second and third dining table linen choices and assigning them to the cocktail/place card/favor tables and cake tables. I opted for plain white linens for the DJ booth and bars simply because fancy linens for nonsense tables get expensive. 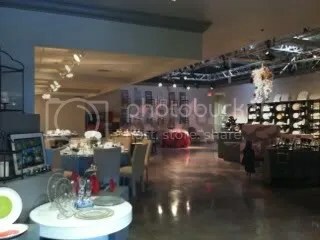 We also finalized the exact plates, glasses, napkins, and silverware for the reception. 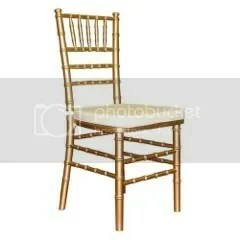 Luckily for me, Raspberry Plain provides gold chiavari chairs free of charge. 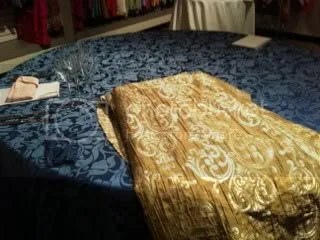 And so, after an hour at the showroom, we now have more tablecloths than I ever imaged one wedding could require, FOUR different kinds of linens at that. The consultant gave me little swatches of my final choices so that I can coordinate with the florist (apparently this is necessary) and we walked away unscathed. TADA!